I don’t think I’m supposed to do this yet but …. I got the cover proof of book 2 today and I’m so pleased with it I wanted to share it with you. 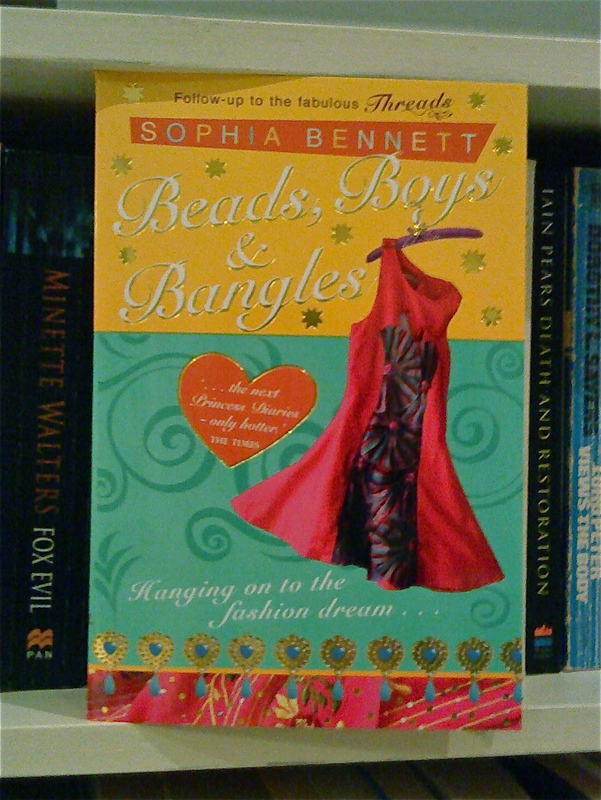 Anyway, I was finishing the book off and I thought of Beads, Boys and Bangles, all of which play a part in the story, though not necessarily in that order. So that’s what it is. The dress is by Tanielle Lobo, whom I met at Central St Martins at her degree show, and who’s launching her career in fashion. Good luck, Tanielle! Loving the dress! Anyway, I’m pleased. I like it. I hope I’m allowed to give you this sneak preview. Tell no-one. But tell me what you think. I had a philosophical argument with my eight year-old today, on our way into Planet 51 (which is OK, by the way. Eight year-old loved it. I’d rather have seen Up, but it’s not a week away from my birthday). We popped into the Waterstones next to our local cinema in Wandsworth and I made the major (but frequent) error of checking for Threads. There were 2 hardbacks in the 9-12 section (where I wonder whether anyone will be able to afford them) and no paperbacks at all. This made me sad. I’ve met quite a few boys and girls recently who were looking forward to reading my book. And thanks to The Times (see below), there may be one or two more. 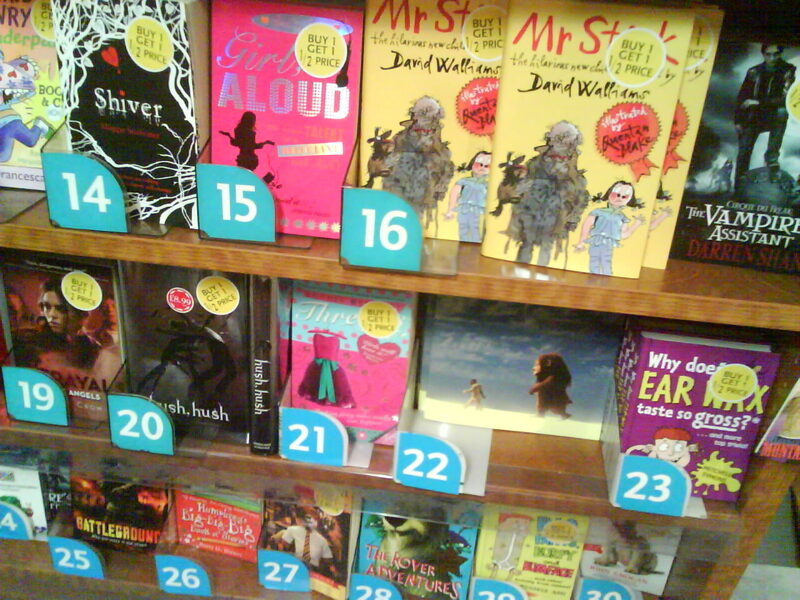 But if they go into this Waterstones to buy a copy, they won’t find one. There’s one copy on order, apparently. This made me sad too. There is no answer to this. THANK GOD FOR MY FAMILY. Thanks to my son, I was able to give Planet 51 my full attention, because I didn’t want to get dizzy by thinking about Waterstones anymore. However, that was the bad bit. The good bit was the amazing Amanda Craig, who some of you may know is already top of my Christmas card list. She included Threads in her recommendations for children’s books for Christmas in The Times. Not that I know it off by heart or anything, but my favourite bit was ‘entrancing debut’. THANK YOU AMANDA YOU ARE WONDERFUL. Cut out Times Christmas books section and keep in the memorabilia file in the shed. 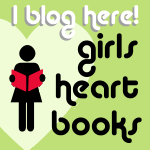 Stop going into bookshops and looking for your own book, woman. You will go INSANE. And it’s not why you wrote it in the first place. Get writing those Christmas cards soonish, so you don’t end up sending them on December 24th, like you usually do, and make sure Amanda Craig gets a good one. Listen to the voice of the eight year-old. He makes sense. 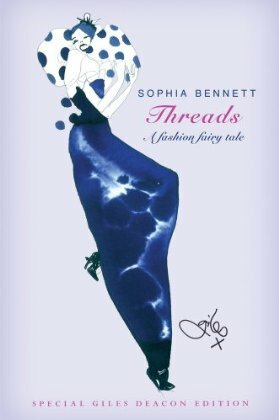 When Giles Deacon (winner of the ANDAM prize this year which means he got invited to show at PARIS COUTURE WEEK – and also designer of the latest outfit for the Cadbury’s Caramel Bunny), agreed to do a design for the charity hardback edition of Threads, a thought did cross my mind. The thought was that my publisher would ring and say ‘Oh, by the way, we’ve got Giles’s original, stunning design in the office. What would you like us to do with it?’And I would say, ‘Oh, just send it over.’ And I would have it framed in my office (shed) and stare at it every day as I wrote and LIVE HAPPILY EVER AFTER. Because it is truly beautiful. And Giles Deacon, as well as being a genius designer is also a lovely person, and that’s important. And original fashion designs are a bit of a dream come true. But what actually happened was that my publishers very sensibly gave it to Save The Children to auction as part of their Festival Of Trees, so that the money raised can go to the children we’re trying to help, who so desperately need healthcare, education, safety and basic stuff. Which means that you can bid for it here. Online bids close on 7 December and the auction itself is on 8 December. Good luck. And let me know if you get her. I’d like to know she’s going to a good home. I know you’re all dying to find out. What happened in the Threads/Girl Aloud face-off in Euston station and Birmingham, when I went to the fabulous Halesowen yesterday? Well, Girl Aloud won hands-down everywhere. Every single chart. I didn’t even take pictures. I put it down to the cover pinkness, naturally, and not the quality of Emily’s writing or the fascinating storyline. I only wish Emily could be here to see it, and not in Australia (where she lives with her family). Anyway, Emily, well done. You can stop now. OK? However, despite the face-off, yesterday was a VERY GOOD DAY. First, I went to Hasbury CE Primary School to talk to Year 6 (who were wonderful – see below), then I was wined and dined by the fabulous Ros Bartlett, before talking to an invited audience at Earls High School and signing yet more books. By the end, I felt like a film star. A film star who gets cake! At Hasbury Primary School, I thought I was going to talk for an hour, but Sue Layton told me that I could ‘have all afternoon if I wanted’. I laughed hollowly, thinking that after about 55 minutes of me the boys and girls would be clawing at the walls to get out. But next thing I knew, Sue was telling me that the going home bell was due in five minutes, and I had to stop if I wanted the chance to sign anything. Where did the time go? I’ll tell you where. It went into chatting to YET ANOTHER bunch of truly impressive young people. Boys and girls again. I’m getting used to this now. We started off with creative writing and I got them to do a whole story. Did they complain? Did they play up? Did they talk in class and make life difficult? Not for a moment. They got their heads down, wrote BEAUTIFULLY for twenty minutes, pausing only to ask how to spell Ferrari, and was the cheetah allowed to eat the peacock? (to which the answer, of course, was yes). And then they all volunteered to read out their stories. Which were BRILLIANT. To the point, really, at which I wonder why I bother. Kids of today have fabulous imaginations, great storytelling ability and a great sense of pace, speech, visual impact, humour, shock value, you name it. How they put up with our stuff, I’m really not sure. They’re very kind. Thank you everyone. You were amazing. I only hope you enjoy my story half as much as I enjoyed yours. And thank you for all your advice about what to put on the website. I’ll follow it up as much as I can, whenever book 3 allows. Then Ros. Ros is a bit of a legend in the West Midlands book community and beyond. Now I know why. Ros’s stories include having Jacqueline Wilson to stay (‘Jackie’ to Ros), and what Anthony Horowitz said last week, and bumping into JK Rowling (I bet that’s ‘Jo’ to Ros) on the steps of her local bookshop. Ros seriously knows how to look after an author and make her feel good. She also knows a local pub – pub is entirely the wrong word for it – maybe Gastro Experience – where the food and atmosphere are sublime. And she knows lots and lots of local kids and their parents whose love of reading has blossomed thanks to her book club, and who get to meet ‘Jackie’, and Anthony, and Cornelia Funke, and lots of other people … and me. So this is the deal. You talk. You answer questions on your favourite subject – writing. You sign books, tickets, flyers, odd bits of paper and whatever is put in front of you. You meet lots of lovely, enthusiastic readers. You are fed yummy, home-made coffee cake. And you are put safely in a taxi in time for the last train home. Is this the best job in the world? SO is. Sorry this one doesn’t have all the girls who posed with me too. Hopefully there will be more later. I now have to come down from my little cloud and actually do some writing. ‘Jackie’ somehow manages to do at least 1,000 words a day, regardless of where she is or what she’s up to. And I don’t think she means blogging. It’s done her no harm. I shall try and follow her good example. More later, people, when I’ve finished Chapter 4. And thank you again for looking after me on Wednesday and yesterday, on part 1 of the international tour. I bet Britney Spears and Madonna don’t have nearly as much fun as me. So when they all trooped into the hall at the Bishop of Llandaff School in Cardiff today, it was a bit of a sharp intake of breath for them and for me. Threads is pink. It’s largely about fashion. I can’t help or hide that. Normally, it’s an advantage. Anyway, I apologised and focused heavily on the Save The Children campaign (there’s now a fundraising competition associated with the book which you can enter by clicking here: www.savethechildren.org.uk/threads) and the whole how-I-became-a-writer thing. And skipped over the pink corset slide mighty fast. Anway, got to the bit where I asked for questions and 180 pupils and staff went very quiet. So I warned them I’d be asking again in a minute, and did another reading. Asked for questions again ….. and got LOADS. Probably more from boys than girls. All interesting (these were Year 8s, by the way. Love Year 8s), all fun to answer, all suggesting that there are a lot of would-be writers in that audience who are seriously considering career options at this stage. Several from boys asking if I’m going to write for boys. And looking disappointed when I said I’m rubbish at techno-gadgets/spies/chases/killer spiders/killer robots/fairies armed with techno-gadgets etc. 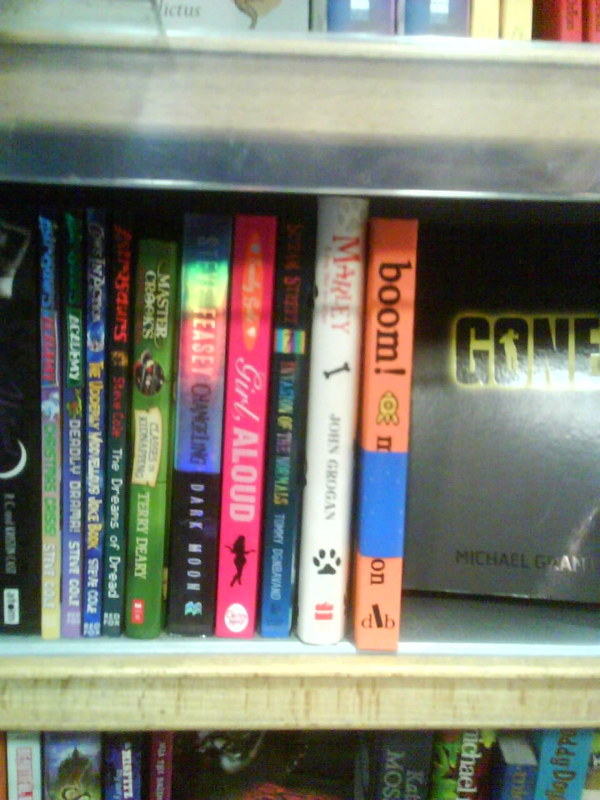 Sorry to pigeonhole boys’ books (which by the way I think are brilliant at the moment), but I have an 8 year-old and read boy stuff a lot and that’s what we read. I managed to salvage it slightly by saying that I love snakes (not sure why, but I was asked, and I do love snakes. And spiders are OK too). But despite all that, I got yet more fab creative writing later, and there was a raffle, and lots of boys ended up getting me to sign books for their mums and sisters for Christmas (and one said he liked reading and it was very definitely for himself. Go you!). Not that the girls weren’t WONDERFUL. They were. But I was just very grateful indeed that their less pink-friendly classmates gave me a chance too. Thank you, Bishop of Llandaff School. It was a fantastic day. Now, look here, Emily Gale. You may be a friend of mine, but your book has been out for days. Days, woman! And it is making its way up the chart with unseemly haste. Make way for the rest of us, why don’t you? So, gentle readers, if you are tempted to buy Ms Gale’s Girl Aloud, can I just say, don’t. You may find it touching, funny and beautifully written. But Threads needs all the help it can get right now. You know where your loyalties lie. Dudley tomorrow. I’ll be checking those bookshops again. Look out, Emily Gale, is all I can say. * Cariad is my favourite (and some might say only) word in Welsh. Lovely language. Lovely people. Lovely trip. Camila Batmanghelidjh, who set up Kids Company, to help disadvantaged children in London. Whenever we write about troubled children, if we had to imagine them meeting the perfect fairy godmother in real life, it would be her. Maria Chenouweth-Casey, who set up TRAID, the company that makes recyling clothes possible, ethical, environmentally friendly, and fashionable. And makes it look easy. But I bet it wasn’t. Helen Bamber, who set up the Medical Foundation for Care of Victims of Torture. She does the impossible, living with all those unbearable stories so she can make things better, and has been doing it since she found herself in Bergen-Belsen, aged twenty, working out how on earth to help concentration camp victims. She is, in fact a saint, but according to Wikipedia, she’s an OBE. Go figure. I’ve been awarded an award. By Justine Windsor, whose Welshcake blog is the first place I turn to when I should be writing my book. THANK YOU JUSTINE. I really don’t know what to say. 1. Copy and paste the pretty picture which you see above onto your own blog. So here we go. Done the picture. Done the thank you and the link. Here are the 7 things. My favourite current TV programme is Phineas and Ferb (on Disney). Which is lucky because my husband and both boys are also addicted and the three year-old needs to watch about 14 episodes a day. You think I’m exaggerating for effect. I’m not. I once came second in a talent competition at school dancing to Dancing Queen by Abba. What was I thinking? I cry at the end of The Railway Children. ‘Daddy. My Daddy.’ Gets me every time. I really don’t have that many pairs of shoes. I haven’t bought any so far this season. Oh. Until yesterday. Drat. My favourite all time song is Hit Me With Your Rhythm Stick by Ian Dury and the Blockheads. I was once kissed by Ann Bancroft (look her up, young people) on the set of Young Winston. And no, this didn’t remotely feed into the ‘kissed by a movie star on set’ scene in the book. Not even subliminally. I have a pair of lucky earrings. They totally work. Enjoy your award, girls (and boy, Sarwat). You deserve it.